Region 8 was created when the American Institue of Electrical Engineers (AIEE) and the Institute of Radio Engineers (IRE) merged in January 1963. However, its seeds were planted by the IRE which, unlike the AIEE, was a transnational society with Sections outside the USA. The IRE had a stronger international character to its organization than the AIEE. Although the IRE Constitution, adopted at the first meeting on 13 May 1912, did not use the word 'international,' nor define membership qualifications by nationality, it was understood that the IRE was open to members around the globe. When Regions were established with the January 1949 Bylaws of the IRE, only the US and Canada had formal Region designations. Sections had been founded, however, including Buenos Aires (1939), London (1944), Israel (1954), Egypt (1955), Tokyo (1955), Rio de Janeiro (1956), Colombia (1958), India (1959), Benelux (1959), Italy (1959), Geneva (1960), Chile (1961), France (1961), and United Kingdom (1962). On 24 April 1962, IRE approved the formation of Region 8 and on 24 May 1962, shortly before the merger, the IRE created Region 8. Initially, the new Region comprised six Sections in Europe, the Middle East, and North-Africa: Benelux, Egypt, France, Geneva, Israel, Italy, but soon after its formation, the UK & RI was added. Dr. Rinia (Benelux) was the first Director of Region 8, 1962-1964. At the time of the merger it was agreed that the IEEE should continue the transnational concept. The first sentence of Section 3 of the IEEE Constitution, dated 9 March 1962, and adopted at the merger, reads: "The character of its scope is non-national, and the territory in which its operations are to be conducted is the entire world." In 1970, Section 3 was revised to read "The character of its scope is transnational and the territory in which its operations are to be conducted is the entire world." The IRE type of structure was adopted, but revised: the number of Regions in the USA was reduced from seven to six; Canada became Region 7; Europe, the Middle East, and North Africa became Region 8 on 8 January 1963, which is therefore the date on which Region 8 was founded; other parts of the world were covered by Region 9. 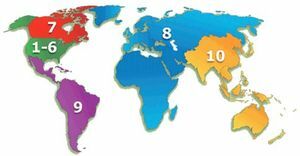 The present Regional structure resulted from later changes: on 1 January 1967 South America became Region 9, with Region 10 covering other parts of the world, still including a great part of Africa; finally on 1 January 1981 the remainder of Africa became part of Region 8. IRE Region 9 boundaries as at 1963. In the days before the end of the Berlin Wall, and the associated political changes in Eastern and Central Europe, IEEE activity in the countries east of the ‘Iron Curtain’ was limited. There was a Poland Section in Region 8, formed in 1972, and occasional IEEE related conferences had taken place there. Other International Organisations such as IFAC and IFIP were rather more successful in organising conferences in this part of the world, because of the way that they had ‘representatives’ of each country in their management bodies. The Hungary Section was formed in 1987, and the Region 8 Committee held a meeting in Budapest in April 1989. After the changes, there was a rapid development of IEEE activity and formation of new Sections. A Region 8 Committee meeting was held in Warsaw, Poland, in Spring 1991 during what were still difficult economic times for Poland. However, growth in membership numbers was (and still is) slow. The economic changes meant that IEEE membership was unaffordable for many professional engineers and academics. Senior members of national research institutes were often able to join using other than personal funds, but in a few cases, they regarded IEEE membership as something of a privilege which they were reluctant to share with junior colleagues. Somewhat later, the R8 Committee held several more of its meetings in the Central and Eastern European areas: Prague, Czech Republic, in 1994, Berlin, Germany in 1999, in what had been East Berlin (part of the former GDR), then at Budapest, Hungary in 2002 and at Kraków, Poland in 2004. The Czechoslovakia Section was formed in 1992 and despite the split of Czechoslovakia into the Czech and Slovakian Republics, a single Section for both has been retained, although that may not be sustainable in the long term. Russia was something of a special case – a huge country with many locations which have extensive Scientific and Engineering activity at a high level – where one might expect, in the long term, to see many IEEE activities develop. However after the IEEE Russia Section was formed in 1990, membership growth was very slow, mainly for economic reasons, although many Chapters were formed, partly with the aid of a financial support initiative from some IEEE Societies, especially from Electron Devices, and who paid for initial memberships so that Chapter formation petitions could be created, and there were a number of IEEE conferences held. Chapter Chairs meetings were held in various places in Region 8 with financial support from Societies in Division I and IV and from Region 8, generally alongside the major conferences of one of the Societies, and the support was enough to pay for the attendance of Chapter Chairs from many of the Central and Eastern European locations. The Microwave Theory and Techniques Society was also very active in this initiative and still is. This led to several similar Chapter Chairs meetings for other Societies being initiated by the Region 8 Committee (for example, one for Signal Processing Chapter Chairs alongside the ICASSP in Istanbul, Turkey in June 2000). However, Chapters in parts of Russia remote from Moscow sometimes complained of lack of support from their Section, and after a while moves to provide some independence for activities in St. Petersburg and Siberia arose. After some suggestions to form a Russia Council were abandoned, there was finally agreement to form three Russia Sections, one to be called ‘North West’ and one ‘Siberia’ – while the original Russia Section retained responsibility for all other parts of the country. Existing Chapters were transferred to the newly formed Sections where the location of their principal activities justified it. Another "problem" with some of the new Chapters was an unwillingness of the initial Chapter Chairs to hold elections and be replaced by other volunteers, resulting in some very long-serving Chairs. This also happened with a few of the new Sections. In the Ukraine Section, there were strong ‘differences of opinion’ between a Chapter in the East part and another in the West part! When the three Baltic Republics (Estonia, Lithuania and Latvia) gained their independence from Russia, there was a suggestion from the Region 8 Committee management to try to form a single ‘Baltic’ IEEE Section, combining the three countries. There was a mistaken belief that they were all rather similar, with languages incorrectly assumed to be Slavic! It took some persuasion to convince some senior R8 IEEE volunteers that this was not the case, and that each had a very different language and culture. An early step was the formation of a Chapter in Estonia, which was affiliated with Finland since there was no Estonia Section. I had the pleasure of announcing the formation of this Chapter to the Region 8 Committee when they met in Piscataway in Spring 1998. To the puzzlement of all except the IEEE Finland Chair, I preceded my announcement by asking the Committee to listen to some music played over the audio system – this was a recording of the Estonian National Anthem, to celebrate the formation of the first IEEE unit in Estonia. It was immediately recognised by the Finland Section Chair because both countries share the same tune for their National Anthems, even though the words are quite different. During the time of the Soviet Union, playing the Estonian National Anthem or showing the Estonian flag were serious offences. Some time passed before the three Baltic countries had their own Sections, with the Latvia Section having only recently been established (in 2008). As mentioned in the September 1995 interview by Bob Winton (archived at the IEEE History Center at Rutgers University, with a link from the Region 8 website), initial attempts to form a Lithuanian Section involved Prof. Raimundas Jasinevicius, from Kaunas University of Technology, who had established links with Universities in London, England many years before, for the exchange of junior academics, etc. Progress with Section formation was very slow and made slower by his absence in Denmark for six years as Lithuanian Ambassador. However, the Section was finally established in 2005, based mainly in Vilnius. This was followed by the Estonia Section formation in 2006. Because of a number of rather new Sections wanting to host the R8 Committee, and because the R8 Committee management was glad of the opportunities to welcome these new Sections by meeting on their territory, the Committee meetings were held in Vilnius, Lithuania, in 2006 and in Sofia, Bulgaria and Bucharest, Romania, in 2007. The next few meetings of the R8 Committee are likely to be in Western Europe, and so the long term average will seem more balanced. Austria: Founded 21 December 1979; Kurt R. Richter, Chairman; Robert Genseer, Vice-Chairman; Andreas Sethy, Secretary; Franz Voggenberger, Treasurer. 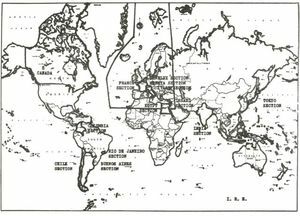 A short history of IRE Region 9 / IEEE Region 8, by Martin J. Bastiaans - A history of IEEE Region 8 spanning its origins from the IRE Region in Europe, through the IRE/AIEE merger forming the IEEE and subsequently to the present day Region 8 consisting of Europe, the Middle East, and Africa. Included are personal reflections of past directors, committee meetings and conferences, student activities, award recipients from Region 8, and Region 8 history papers presented at HISTELCON 2012. A number of archival documents are attached as appendices, including ephemera and minutes from early Region 8 Committee meetings. Region 8 Centennial Review, issued in 1984 for the 100 years of IEEE. Early history of Region 8 and the UK & RI Section, by Bob Winton, Mick Byford, and Robert Williams - An interview conducted by William Aspray on 4 September 1995 for the IEEE History Center. ↑ The Italy Section was split into two Sections, Italy (North) and Italy (Central & South) on 23 May 1966; until 1988, Italy (Central & South) was called Italy (Middle & South). The two Sections were merged again in November 2005. ↑ The Switzerland Section was called Geneva Section until 20 September 1967. ↑ Until 1 November 1966, the UK & Rep of Ireland Section was called the UK & Eire Section. ↑ Until 17 June 1991, the Germany Section was called the West Germany Section (until 20 September 1967) and Germany (West) Section (after 20 September 1967). ↑ The Yugoslavian Section was established on 21 June 1971. Following the wars in Yugoslavia, in 1992 the Region 8 Director Kurt Richter organized a meeting with three members of the Yugoslavian Section Executive Committee in Graz, Austria. It was decided to form by petitions three new Sections, as three equal successors of the previous Yugoslavian Section: the Slovenia Section, the Croatia Section, and the Yugoslavia Section, all established on 1 August 1992. It was a friendly splitting into three new Sections and in 1996 all three Sections celebrated their 25th anniversary. In 1997 the Republic of Macedonia Section was formed. The name Yugoslavia became an increasing anomaly, and in 2005 it was renamed the Serbia and Montenegro Section; the Bosnia and Herzegovina Section was formed later that year. ↑ The South Africa and Nigeria Section were initially Sections of Region 10. They were assigned to Region 8 on 1 January 1981, when all of Africa was shifted from Region 10 to Region 8. ↑ The Kenya Section has been called the East Africa Section for a couple of years, and was renamed Kenya Section again in August 1990. ↑ The Western Saudi Arabia Section started as the Jeddah Subsection of the Saudi Arabia Section; formation date 16 February 1987. Until 15 August 1990 it was called the Jeddah Section. ↑ After the Russia Section (initially: Moscow Section, until 28 February 1993) was formed in 1990, membership growth was very slow, mainly for economic reasons, although many Chapters were formed, partly with the aid of a financial support initiative from some IEEE Societies, especially from Electron Devices, and who paid for initial memberships so that Chapter formation petitions could be created, and there were a number of IEEE conferences held. However, Chapters in parts of Russia remote from Moscow sometimes complained of lack of support from their Section, and after a while moves to provide some independence for activities in St. Petersburg and Siberia arose. After some suggestions to form a Russia Council were abandoned, there was finally agreement in 1993 to form three Russia sections, one to be called ‘Northwest’ and one ‘Siberia’ – while the original Russia Section retained responsibility for all other parts of the country. Existing Chapters were transferred to the newly formed Sections where the location of their principal activities justified it. ↑ The Cyprus Section started as a Subsection of the Greece Section; formation date 18 July 1988. This page was last edited on 28 January 2019, at 21:41.